Want it by Wednesday 24th April? Order within 3 days, 12 hours, 3 minutes and choose Royal Mail Tracked 24 Hour at checkout. 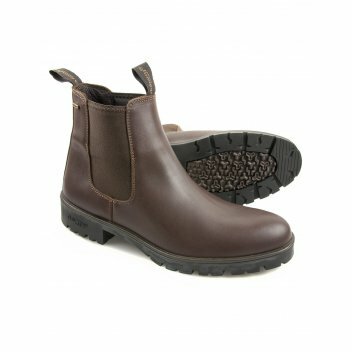 The Wicklow boot is a chelsea style men's leather boot lined in GORE-TEX® for breathable waterproofness. It comes in Walnut and Mahogany high quality leather finishes. The Wicklow ankle boot features side gussets and a Dubarry two finger pull for a smooth on/off fit. The Wicklow jodphur boots come with a durable heavy-cleat outsole and subtle signature Dubarry and GORETEX® branding.